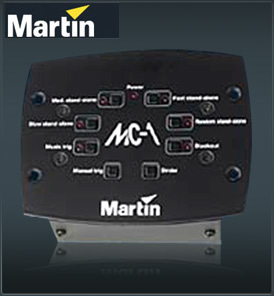 The MC-1 is a small remote controller for easy and fast operation of dedicated products. The MC-1 can, with no programming at all, coordinate all connected products for a perfect synchronization of movement, color and gobo change. The control options provide fast, medium, slow and random shows via the built-in microphone. Furthermore it is possible to strobe, blackout and freeze the fixtures at any time. The MC-1 is especially compatible with the MX scanners, CX color changers, MiniMACs and the Acrobat. Via the fixtures’ settings, movement, color and gobos can be inverted for an even greater variety of effect options. The MC-1 can be operated standing on a table or built into a control desk. A 19 inch front plate is also available.